I don't look very happy in this photo, and I'll tell you why. Cut 1.5 yards white linen. Keep the selvage edge smooth. Measure 10 inches on the fold and cut. This will give you an isosceles triangle, 55" x 10". Hand sew a narrow hem on the slanted edges - the selvage [sic] edge is already finished. How wide should you cut your 1.5 yards of linen? If you fold it in half, measure 10 inches and cut, you get a rhombus, not a triangle. You can hem the slanted edges, and the selvedge edge is finished, but that then leaves a long edge to also cut. I decided not to use these directions. 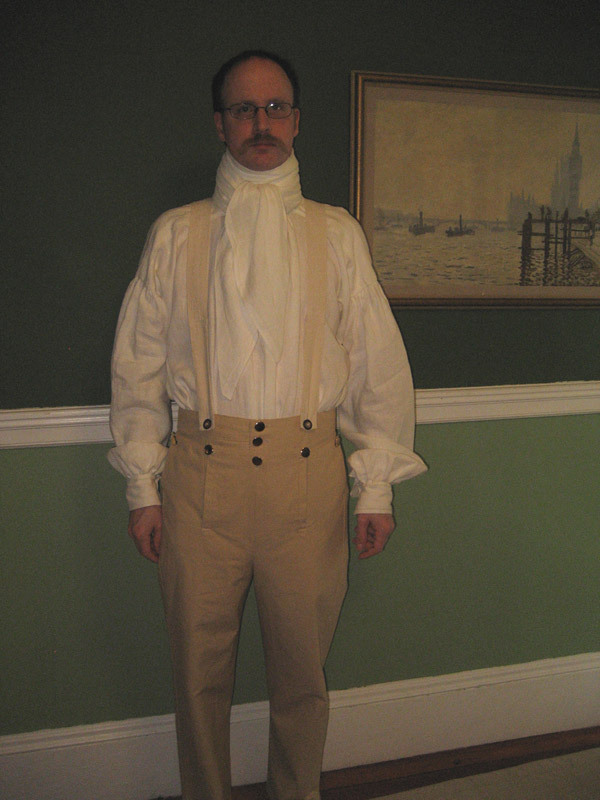 I have a Victorian shirt pattern (Laughing Moon #107) which gives patterns for various styles of neckwear, including one for a cravat. 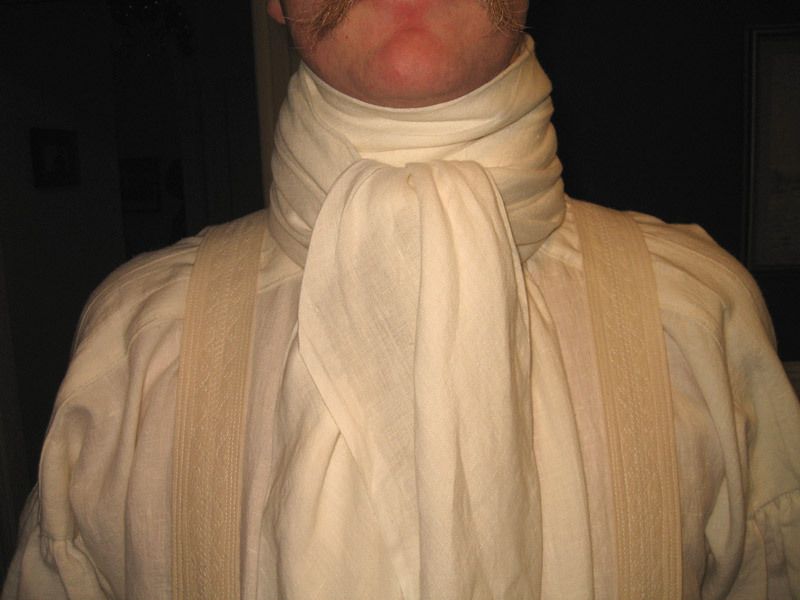 It's very simple: cut a 50" square of linen, and fold it up on the bias to form the cravat. I decided to take this approach. When I wrapped it around my neck, and made it tight enough so that it didn't look too bulky, it sure helped my posture! I think that if I just cut about 10-12" of fabric from my 56" width, and make it into a rhombus like the picture shows, I'll have something about right. At 56" it might not be as long as when I fold my giant square along the bias (corner to corner), but I'll at least be able to get a small knot, if not a big poofy fold. It'll mean a lot more hand-sewn rolled hems. Ah well. I read your post right after reading the aforementioned directions. And I agree, they make no sense as stated. What I believe the person is trying to say is: take 1 1/2 yards of material 45" wide. Fold it in half lengthwise TWICE (fold once, then bring fold up to selvedge for the second fold). You now have a piece of material 11 1/4" x 54". Starting 10" in from the double folded side, cut to the corner on the opposite side of the short end (selvedge side). Measure in 10" in from the selvedge on the opposite short end and cut to the corner of the double fold for a 45 degree isosceles PARALLELOGRAM. Pin around three sides, press, and hem. 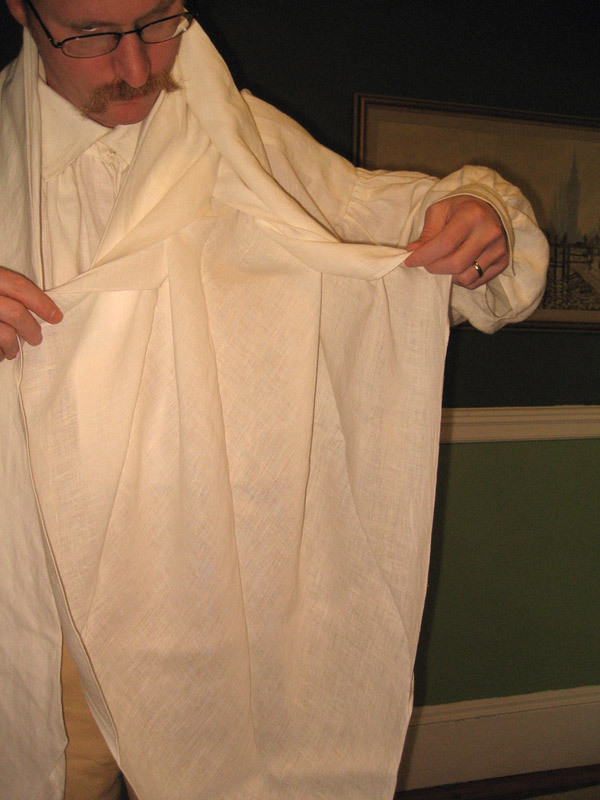 Turn it inside out and hem the remaining side. That is still 4 layers of material which seems like a lot. I am going to try this starting with the material cut in half lengthwise (22 1/2" X 54") and only fold it once (11 1/4 x 54" finished). I've been trying to figure this out for awhile too. Alex, you're probably right on the money with the folding directions. I still don't see how following the directions as written end up with that triangle, but given that, I should be able to make a triangle of linen. I may very well have to do a second cravat post and try out this method. Her directions were actually good If it's who I think it is. The picture that explains it is pretty well. "teainateacup" is where I found it. This may be different from the one you used. I've never understood WHO or WHY thought this folding method of linen would work and come out attractive. It generally ends up very messy and unflattering looking when attempted. 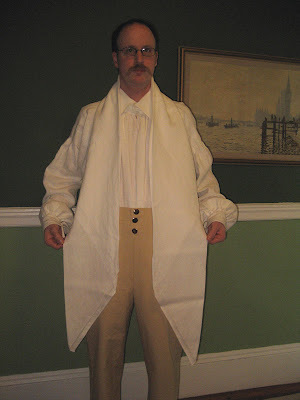 The best cravat is simple piece of linen, cotton, cotton lawn, or natural silk about 6-8" wide and whatever length you desire it to be that has been finished with a lovely hem on all edges. I've used all the above fabrics from Whaleys in England and they are just beautiful. Your stock collar came out wonderful - thank you for the photos!